Compartment syndrome is a condition that results from swelling of a muscle. The muscle is retained in its fixed volume fascia (its “compartment”), however, and thus the swelling of the muscle causes an increase in pressure within the fascia, and subsequent occlusion of the blood supply and normal functioning of the tissues in the compartment. This can result in infarction, and is usually excruciatingly painful. If left untreated, it can result in loss of limb, or less severely an ischaemic contraction known as Volkmann’s Ischaemic Contracture. It typically occurs in the forearm and calf, but can also occur in the thigh and foot. It is usually acute as the result of trauma, but occasionally occurs chronically in athletes. It is often a clinical diagnosis, but it can be confirmed by the measurement of compartment pressures. It requires an urgent fasciotomy to prevent irreversible ischaemia. Irreversible damage can occur within 4-8 hours of the onset of ischaemia. Compartment syndrome is the reason that we use a ‘back-slab’ as opposed to a ‘full cast’ in an acute fracture. The swelling seen with an acute fracture injury would quickly cause compartment syndrome if a full cast was applied. Swelling of the muscle – usually as a result of post-traumatic bleeding and oedema. Initially only venous flow is disturbed, and arterial flow (due to its greater pressure) still occurs. Eventually, the pressure within the compartment exceeds the arterial pressure, and the muscle begins to undergo ischaemia. This means that distal pulses and neurological exam are usually normal until VERY LATE ON! If there are reduced or absent pulses, then it is likely the diagnosis is too late to stop severe ischaemic damage. Imaging – not indicated for the diagnosis of compartment syndrome – but obviously often useful for the diagnosis of any underlying fractures! 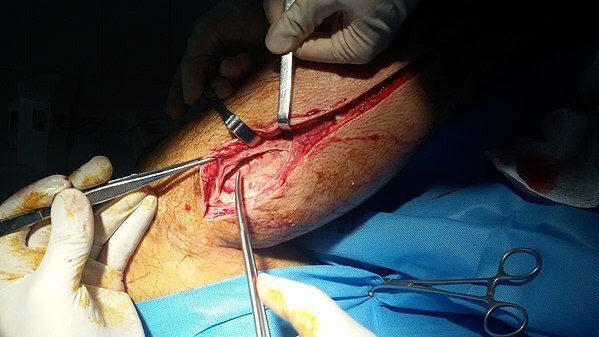 Fasciotomy – of the muscle compartments involved. Do it as soon as possible! To minimise the risk of irreversible ischaemia. Call surgeon to arrange fasciotomy! If there is any doubt over the diagnosis, perform fasciotomy!